The Philippines' leading carrier, Cebu Pacific Air (PSE:CEB) now posts all-inclusive fares on its booking channels. Aside from the base fare, the amount reflected includes web admin fees, Manila airport terminal fees and country-specific taxes. To highlight this development, CEB holds a seat sale to Hong Kong, Singapore, Dubai, Riyadh, Kuwait and Sydney until April 27, 2015 or until seats last. This is for travel from May 15 to August 31, 2015. 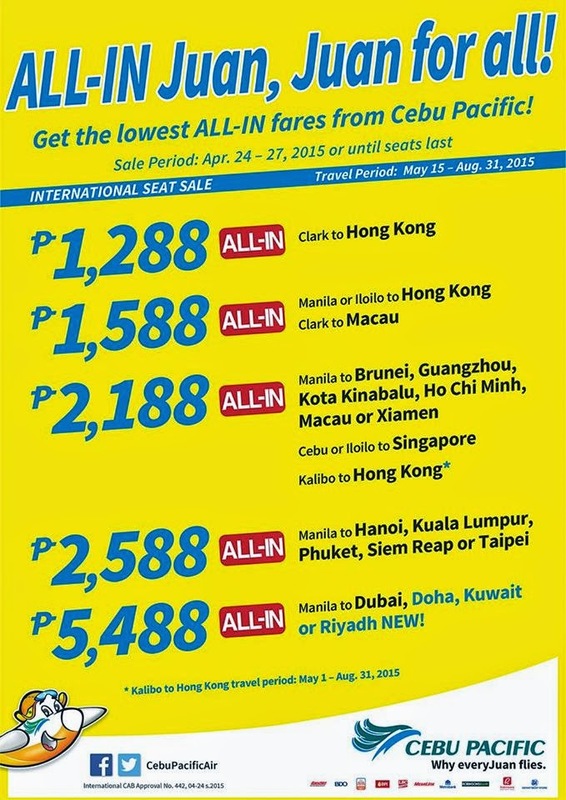 Travelers can book P1,288 seats from Clark to Hong Kong, and P1,588 seats from Manila or Iloilo to Hong Kong. P2,188 seats are also up for grabs from Kalibo (Boracay) to Hong Kong. Those traveling from Iloilo and Cebu to Singapore can also take advantage of P2,188 seats. CEB recently ramped up select Hong Kong and Singapore services from Manila, with additional seat capacity (from 180-seater Airbus A320 to 436-seater A330 aircraft). Meanwhile, long-haul routes are also on sale for the same travel period, except for Doha which will begin operations on June 4. CEB offers P5,488 seats from Manila to Kuwait, Doha, Riyadh and Dubai, as well as P5,888 seats from Manila to Sydney. "Cebu Pacific's new all-in structure will make the total fare more transparent, and the booking process easier for our guests. We look forward to stimulating traffic to our destinations, with our trademark low fares and extensive network," said CEB VP for Marketing and Distribution Candice Iyog. Country-specific taxes do not include the Philippine Travel Tax, as this depends on the passenger's classification. It may be manually added at ticket offices or at the airport. Optional travel products such as baggage allowance, CEB Air Wi-Fi, meals, merchandise and seat selection are available for a fee. For bookings, passengers can visit www.cebupacificair.com or reservation hotlines (02)7020-888 or (032)230-8888. They may also download the Cebu Pacific official mobile app on the App Store and Play Store. CEB's 55-strong fleet is comprised of 10 Airbus A319, 31 Airbus A320, 6 Airbus A330 and 8 ATR 72-500 aircraft. It is one of the most modern aircraft fleets in the world. Between 2015 and 2021, Cebu Pacific will take delivery of 7 more brand-new Airbus A320 and 30 Airbus A321neo aircraft.